I was assigned to Truck Company 1, Oldtown Station, which covers the lower eastside business district in downtown Baltimore City. Truck Company 1 is consistently ranked among the busiest Truck Companies in Baltimore, responding to over 3,000 calls for service every year. On August 2, 1996, at approximately 5 P.M., a fire was reported in an office building in the 600 Block of N. Davis Street and a box assignment was “struck out” by the Communications Division of the Baltimore City Fire Department. A box assignment consists of 4 engine companies, 2 truck companies, a battalion chief, an air-flex, and medic unit. Engine companies bring water and hose, truck companies are equipped with the ladders and tools. Truck Company 1 arrived on the scene first and reported smoke showing from all floors of a 5-story building in the rear location. I, along with other members of Truck Company 1, put ground ladders in place and entered the building to search for any trapped occupants, to ventilate the structure, and to provide access to the seat of the fire for incoming engine companies. Upon entering the building, we encountered extremely dense smoke and intense heat. I made my way to the 5th floor stairwell, after performing a primary search of the rest of the building, and was about to enter that floor when I heard an engine company advancing a hose-line from the floor below to my location. This is typical of aggressive interior firefighting operations that are necessary to limit the fire from extending to adjoining structures. I utilized a ceiling hook to penetrate the ceiling and exposed the seat of the fire in that space. Due to a delay in getting the charged hose-line in place, the fire progressed very rapidly, as it was being exposed to more air and the area “flashed over”. A flashover occurs when the internal temperatures are sufficient enough to ignite the flammable gases that occur, as a result of the thermal layering of those gases in enclosed spaces. The force of the simultaneous combusting of those gases was enough to send me over a railing and down the stairwell to the first floor. I hit the ground with enough force that it caused the separation of components of my helmet to occur. The incident escalated to 5 alarms, which should sufficiently show the severity of the fire and the severity of the mechanism of the injury suffered. Despite the severity of the injury, my post-surgical recovery went remarkably well and I was able to return to the full performance of my duties within 3 months. "The claimant did injure his back lifting weights working out on May 8, 1999 when he was not working as a Firefighter, and his physical incapacity is not the result of an accident occurring while in the performance of duty at some definite time and place and without willful negligence on his part." ​co ntinued with the full performance of my duties until I experienced another episode of back pain that caused me to seek medical treatment again in June of 2002. It was found that the narrowing of the vertebral disc space that was evident in the occurrence of the original surgery had progressed to the point that surgical intervention would be required. It was again determined by the City of Baltimore that I would be retired due to the injury. Despite settled Maryland Law on the issue of the causation of work-related injuries, the City of Baltimore incorrectly classified this as a Non-Line of Duty injury. I grieved this erroneous determination with my Union representative. I was informed that the grievance was rejected due to my status reflecting that I was being medically disqualified from the further performance of my duties. An appeal to the Court was timely filed in this matter. The appeal was dismissed due to a lack of prosecution. Upon being notified of the dismissal, I requested of the Court to reopen the appeal, however, that request was denied. Rather than appeal that decision, I filed an action in the United States District Court for the District of Maryland, for discrimination against the City of Baltimore. The fraud that is alleged is detailed herein. What happens when the City says you are done? not only withheld from the administrative hearing examiner, but other professionals involved his case, despite the fact that the City of Baltimore was paying the costs of the Vocational Rehabilitation program. This permits the Baltimore City Solicitor to fabricate the record as they need to in order to obtain a ruling that is favorable to them. This information was withheld from the hearing examiner for that exact purpose. In the context of the broad tapestry of misconduct presented in this matter, there is perhaps nothing as primary and significant, as the manner in which the Baltimore City Solicitor’s office perpetrated their fraud and provided false and misleading testimony on the most fundamental aspects of it. In the following I intend to fully set forth those violations sufficiently enough to demonstrate that a long-standing pattern and practice of fraud is being committed by the Baltimore City Solicitor’s Office in the awarding of Line of Duty Retirement Disability Benefits from the Fire & Police Employees Retirement System of Baltimore City. The fraud perpetrated in this matter was comprised of numerous acts of misconduct. Although recklessness is all that need be shown to establish a fraud on the Court under the controlling authorities, the vast majority of the conduct here was clear, intentional, and willful. Together, the acts amounted to a pervasive fraud driven by the goal of prevailing at whatever the cost. The following selected examples discuss only some of the more egregious acts of fraud. Article 22 of the Baltimore City Code was enacted for the purpose of providing retirement allowances and death benefits under the provisions of that subtitle for such officers and employees of the Department of Aviation, of the Police Department and of the Fire Department of Baltimore City. The City Solicitor of the City of Baltimore is the legal advisor of the Board of Trustees of the Fire and Police Employees Retirement System of Baltimore City. Firefighters who are disqualified from the further performance of their duties by the City of Baltimore are ordered to file an application with the Board of Trustees of the Fire and Police Employees Retirement System of Baltimore City. The Board of Trustees is responsible for conducting hearings on all matters involving non-line-of-duty disability claims, line-of-duty disability claims, 100% line-of-duty disability claims, line-of-duty death benefit claims, and any related matters arising out of these claims. One hearing examiner from the Panel of Hearing Examiners, provided for by the Board of Trustees of the Fire and Police Employees Retirement System of Baltimore City hears claims for benefits and conducts the hearings in an informal manner, with sufficient latitude to provide a fair and impartial hearing to all of the parties without requiring strict compliance with the rules of evidence. Testimony at the hearing is under oath and recorded. The hearing examiner has the power to subpoena and require the attendance of witnesses and the production of papers and documents to secure information pertinent to the hearing, and to examine them. While the Baltimore City Code does not require a strict compliance with the rules of evidence, for matters before the Panel of Hearing Examiners, it does not effectively throw them out to allow the Baltimore City Solicitor to have complete control over the process or to disobey state law on the issue. Under the Administrative Procedures Act of the State of Maryland Subtitle 10-213 (b), it provides that the presiding officer may admit probative evidence that reasonable and prudent individuals commonly accept in the conduct of their affairs and give probative effect to that evidence. Probative evidence is that which has the effect of proof, tending to prove, or actually proves the elements of a case. It is obvious that the City Solicitor has taken full advantage of this rule and has used it to admit evidence that was totally irrelevant. It also does not allow the Baltimore City Solicitor to withhold probative evidence. The record presented shows that not only was irrelevant material introduced to the hearing examiner, which can only be viewed as an attempt to convolute the record and cause confusion, while relevant and probative medical evidence was willfully withheld from inclusion. This includes virtually the entire incident that led to me to be medically disqualified a second time. This information was vital to being able to prevail at the hearing before the F&PERS. This information was excluded because it was favorable to my case and it was withheld purposely to ultimately deny retirement benefits. Dr. Halikman is a doctor employed by the City of Baltimore to offer opinions on cases that involve an employee’s disability who are undergoing the retirement process, such as I underwent. It is obvious that evidence of my medical file, which held relevant and important information relating to this injury, was withheld from even Dr. Halikman. 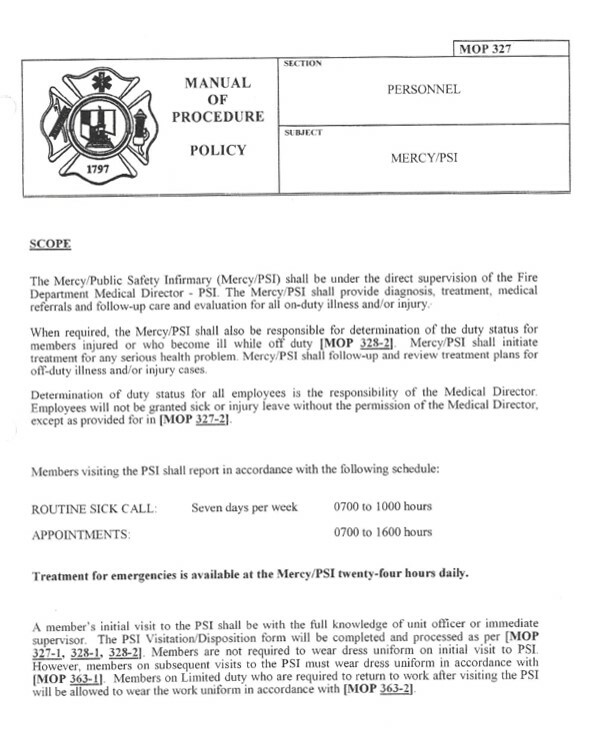 As for Dr. Halkiman’s uncertainty as to whether I was disabled, obviously, he is unaware that the medical director for the City of Baltimore made this determination under the standards found in NFPA 1582, relating to firefighters who are seriously injured in the Line of Duty and wish to return to duty. I, nor my treating physician, ever asserted that I was disabled. “Documentation in the medical brief and the Claimant’s testimony at the hearing reflecting his subjective complaints of physical inability resulting from pain must be discounted on account of his impeachment of his credibility from false statements he made in his 10/28/02 Application for Disability (Form 27EE) and during the 6/9/03 hearing held before you. On his Application, Claimant answers question 13(a) (“Date of injury occurred”) by listing his line of duty, within 5 years 3/23/99 accident as the cause of his herniated disc disability. When he first applied for line of duty disability retirement on 5/5/00, the Claimant listed his 8/2/96 injury as the cause of his herniated disc disability (which was within 5 years of that application) but not the 3/23/99 incident. Moreover, the Claimant answered “No” to question 13(f) (prior injuries) even though he has already applied for disability benefit for this injury and the medical brief is replete with documentation regarding multiple injuries to his back occurring on 8/2/96, 5/10/97, 3/23/99, 6/4/99, 2/3/00, 3/17/00, 9/15/01, and 6/7/02. I originally injured my back on 8/2/96. I was subject to retirement in 2000 because of the injury and was denied benefits, as the hearing examiner determined that I had sufficiently recovered from that injury enough to return to work and perform my duties for a considerable time after that. There was evidence that a herniated disc, that was evident in the original occurrence had progressed but could not be the cause of my pain. It was found to be the scar tissue that had accumulated over the time since the first surgery and had to be considered a new injury rather than just a recurrence. If not, I could not have recovered sufficiently, as evidence shows I had the scar tissue accumulating the entire time, which all evidence to the contrary would then show that I had not recovered from that surgery. In question 13(f) (prior injuries), I was simply reflecting that I suffered no other injury than the one I suffered in the Line of Duty before I entered the Baltimore City Fire Department. In both of these instances there is no attempt to be considered non-credible in my testimony before the hearing examiner. This is just another misrepresentation by the City Solicitor to stack the deck in the City of Baltimore’s favor. The Fire and Police Employees Retirement System of Baltimore City had the responsibility of assembling the medical record on behalf of the City of Baltimore and submitting it to the Panel of Hearing Examiners. In the occurrence of the first hearing for retirement benefits, the hearing examiner erroneously used, as a rational basis to deny Special Line of Duty Retirement Benefits, an injury occurring on May 8, 1999, as the cause for my medically being disqualified from my duties. (THE RECORD, PAGE 10. ALSO SEE DECISION 1,) It was impossible for me to be working out with weights on May 8, 1999, when the record clearly shows that I was already placed off duty on March 23, 1999 for an injury associated with the Line of Duty that occurred on August 2, 1996, which required surgery. There is no evidence in the record of an incident occurring on May 8, 1999. As previously mentioned, this decision was appealed, due to the hearing examiner’s error, and I was reinstated to my duties. The City of Baltimore contends that I wasn’t happy with the hearing examiner’s decision and chose to return to my duties. This is simply not true and is a total misrepresentation of the facts knowingly for the direct purpose of confusing a finder of facts of those facts. The Baltimore City Solicitor knew of the decision of the Chief of Fire Department to reinstate me due to the error that was made and the appeal pending in the Court to address it due to the possible legal liability it posed to the City of Baltimore. The Hearing Examiner was obviously biased and was motivated to deny the rightful benefit also from returning me to the performance of my duties. In this instance he abused his discretion. That cannot be argued, the evidence is plain on its face. After having problems someone typically has after suffering from an injury like this, and suffering further injury to the spinal column resulting from having such an invasive surgery, I again experienced pain on several occasions both in the Line of Duty and Non-Line of Duty in the location of the previous injury in 2002, which led to being deemed medically disqualified from the performance of my duties by the City of Baltimore a second time. I was ordered to apply for Special Disability Retirement Benefits from the Fire and Police Employees Retirement System of Baltimore City. A second hearing was conducted, in the same procedure as that aforementioned in the occurrence of the first proceeding before the same hearing examiner that made the erroneous determination in the first hearing. The City of Baltimore was represented by the Baltimore City Solicitor. I was not represented by counsel and was determined to be “not disabled from the further performance of the duties of a firefighter” and again denied Special Line of Duty Disability Retirement Benefits. As I testified before the hearing examiner, the FCE required for the purpose of the hearing for retirement disability benefits should have been scheduled by the medical director for the City of Baltimore before the “Cut-Off” date of employment with the City of Baltimore on 12/28/02, as mentioned by the City Solicitor, but it wasn’t. I had no obligation to do this or provide it. The question of it not being submitted to the hearing examiner was a question for the City of Baltimore, who was not required to be present at the hearing. Again, the City Solicitor takes the evidence and the entire hearing off the rails and into a realm of make believe. As aforementioned, Plaintiff did not “miraculously” return to work because he was not awarded the more lucrative line of duty benefit. Plaintiff was reinstated to his duties, as a result of an appeal that was filed challenging the decision of the hearing examiner. At no point did Plaintiff ever decide anything, as far as his ability to perform his duties. Plaintiff’s retirement was decided by the medical director for the City of Baltimore. The entire letter that was submitted as part of the record by the Baltimore City Solicitor is a total fabrication of the facts and should not have been allowed to be introduced. The high offices of the accused, the manner in which these allegations are presented, the gravity of those allegations, and the importance of the questions presented for review demands this manner of relief. Criminal misconduct by elected officials has become a recurring issue in Baltimore and the citizens, as well as municipal employees deserve and expect city officials to act in the public’s best interest. Yet contrary to this, we have been subjected to one story after another about corrupt officials using positions of influence to benefit only them, while diminishing the complaints of the people that make substantial contributions to the public health and welfare of the City. There have been countless allegations of this sort of conduct being demonstrated in the media, on postings on the internet, and complaints filed before agencies charged with investigating them, yet these occurrences rarely get the level of attention that is required to uncover the criminal conduct involved. There is a culture of corruption that trumps the rights of the citizen in Baltimore and as a result it has shaken the public’s trust in those government officials. Timely and responsibly meeting the medical and basic living expenses of firefighters who are determined to be disabled after being injured in the Line of Duty, is not just a legal obligation but a moral one. An injury such as the one that I suffered should not result in medical conditions worsened by delay and denial of necessary benefits, nor should it leave the firefighter, or their family, financially destitute and emotionally battered. Those entrusted with maintaining the medical files related to injuries suffered in the performance of a firefighter's duties have a clear responsibility to do so, as provided for in the Baltimore City Code. In no way should the failure of officials within the City of Baltimore to properly maintain and submit the complete medical files of injured members to investigatory authorities create obstacles bound to worsen the physical and financial conditions of members of the department who have suffered debilitating injuries. Instead of carrying out these duties consistent with their legal and moral obligations, the Office of the Baltimore City Solicitor, legal counsel for the Mayor and City Council of Baltimore, routinely and improperly chooses to forward legally inconsistent arguments, withhold relevant evidence that they have in their possession, and fabricate evidence that they don't have, to unlawfully obtain a ruling from the courts that is favorable to them, so the wrongful denial of what is ultimately the City of Baltimore's obligation to the members of the Fire & Police Employees Retirement System can continue. The lack of responsible oversight allows the Baltimore City Solicitor’s long-standing pattern and practice of disability discrimination to continue at their will. This action follows over a decade of extraordinary efforts to hold accountable for their corrupt practices Baltimore City officials and presents allegations of fraud perpetrated by those officials with the intent of preventing the judicial process from functioning in its usual manner that involves violations of laws, so fundamental to the administration of fair justice that it undermines the workings of the adversary process itself. More importantly, newly discovered evidence that I did not, and could not otherwise have access to prior to the present time, will show that it is about far more than an injury to a single litigant. It is about a wrong against the institutions set up to protect and safeguard the public, institutions in which fraud cannot complacently be tolerated being inconsistent with the good order of society. The assessment of this request should include the conduct addressed in it that is focused on governmental actors, who are required to operate under a higher standard of care in light of the power they hold in our society. When they fail to do so, it puts everyone at risk. Here, the Baltimore City Solicitor's Office has abandoned this fundamental objective and also any effort to observe the constitutional rights of the citizens of Baltimore. Instead, they go all in to win at any cost to the detriment of the very system of fair and equal justice these appointed attorneys for the City of Baltimore swear an oath to uphold. The actions of those accused threatens not only the judicial process but also all citizens who are exposed to litigating matters before the court. This assertion is absolutely false and the misrepresentation of this fact is done knowingly and willingly by the City Solicitor. I was determined to be medically disqualified using the physical standards for firefighters, as prescribed in NFPA 1582 Section 9.9.8.1 Spine Structural Abnormality, Fracture, or Dislocation. These policies and standards were accepted by the Baltimore City Fire Department and utilized by the City of Baltimore to deny me from continuing the further performance of my duties. If the entire medical record would have been introduced, and the probative evidence given the weight required by law, it would demonstrate that I was ready to return to duty, as I had felt as though I recovered sufficiently to return to my duties in the abbreviated time allowed due to the incorrect classification of this injury being a Non-Line of Duty occurrence by the City of Baltimore. I reported this to my doctor who noted that “Brian is anxious to return to work, so I think it is appropriate to do so.” I then reported to the medical clinic for the City of Baltimore and informed Dr. Lyons that Dr. Rybock was preparing to release me to duty. Dr. Lyons then consulted with the medical director for the City, Dr. James Levy, who determined that I was to be medically disqualified. I reported this to my doctor who noted in his next report the fact that I was being retired. The hearing examiner, upon the occurrence of the hearing, asked if a Functional Capacity Examination, or an FCE, was performed in association with the determination of the City to medically disqualify me from the further performance of my duties. An FCE was not submitted because the City of Baltimore never scheduled me to be examined prior to my Cut-Off date of December 28, 2002. An FCE was conducted in March of 2003, as part of the Vocational Rehabilitation process. I offered that an FCE was conducted, but well after the Cut-Off date and was inappropriate to utilize at the hearing, as evidence shows that I was awaiting to have a further surgery for the injury at the time the FCE was conducted and the City failed to submit any evidence related to it to the hearing examiner. As I was awaiting the extensive spinal reconstructive surgery which took place in October of 2003, it is inconceivable that anyone could demonstrate anything other than self-limiting behavior in an examination to test his capacity to perform work just prior to surgery. As is reflected in the letter, “the FCE occurred 3/11/03,” well after the “Cut-Off” date of 12/28/02. As this FCE was conducted for the purpose of the Vocational Rehabilitation plan, to assess my physical ability to do work, the representatives who performed this examination were not aware of the fact that I was awaiting to have surgery at the time of that examination. The Medical Director for the City has final discretion over the duty status of all members of the Baltimore City Fire Department. ​​​of the fire department. As the hearing examiner’s determination was that I was not disabled from the performance of my duties, and it has not been disturbed upon any appeal to this date, there is nothing that denies me from my contractual right to my position, as is reflected in Article 22 of the Baltimore City Code. For the City to characterize the appeal in the first occurrence to not be pursued and withdrawn, as if no action by the City was taken on it, is a fabrication of the truth that is well known by the City Solicitor. I was reinstated to my duties by the Acting Chief of the Fire Department in response to the appeal filed challenging the hearing examiner’s decision. When I was reinstated, as I did not want to be retired in the first place and never asked for it, the appeal was settled and there was no need to pursue it. I would like to take this opportunity to demonstrate the “extensive, extensive efforts to accommodate Mr. Vaeth”, as the City Solicitor believes those efforts to be, paying particular attention to the accommodation that was made and is shown in, wherein the Chief was instructed to fire Plaintiff upon the occurrence of his reinstatement in 2001. (EXHIBIT 9) When this evidence was brought forth, the City Solicitor explained that former Chief Goodwin was fired and his credibility was in question. When Chief Goodwin announced his retirement from the department, he disclosed that it was due to the illness of a family member. On August 15, 2002, the Baltimore Sun reported that in a continuing push to privatize City services, the Baltimore City Board of Estimates hired a hospital and a management company yesterday (8-14-2002) to examine City Workers Compensation Claims. The contracts were awarded to Mercy Medical Center to operate the Public Safety Infirmary for $2 million dollars, and to Comp Management for $4 million dollars. These two companies had already been operating these services on behalf of the City long before 2002. Evidence shows that they were involved with the City of Baltimore, as far back as 1999, around the same time as Mayor O'Malley's "Return to Work" initiative began. The idea for privatizing the clinic stemmed from a May 2001 study by the Greater Baltimore Committee. A comment in the article from a Union official that represents City and State employees stated that, "It doesn't take a genius to know that private companies will make medical decisions based on the bottom line." City officials said that the deals would save the City money in large part because the contractors will do a better job of detecting fraud and getting injured employees back to work.